The temperature is so hot in California right now, that my new idea of a good time is curling up in my shortest shorts under the nearest AC vent while reading a magazine. Doesn’t that just sound divine? Forget poolside. Poolside still means you’re outside, of which I want absolutely nothing to do with. It’s over one-hundred degrees out there – staring at a glistening pool is not my idea of a good time. And frankly, neither does swimming (hello, bikini – no thanks) but that’s a different story. Not to mention, we don’t have a pool or know anyone with a pool besides my grandma, who lives about 15 minutes away. We could go over there to swim, but that requires bearing the heat and travel time which doesn’t bode well when the temperature gauge is over a hundred. 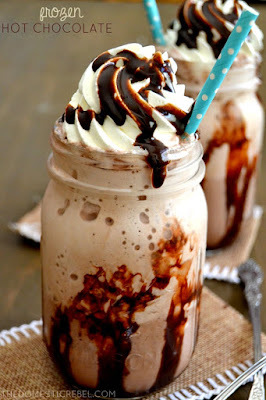 These freezy-cool, ultra chocolaty Frozen Hot Chocolates are to-die for! Rich and creamy, you'll love the cocoa flavor and frosty texture. In a large blender, blend together the milk, ice, hot cocoa packets, chocolate and vanilla extracts on high speed until blended and smooth, about 1 minute. Pour into two tall Mason jars or glasses and garnish with fresh whipped cream and chocolate syrup. Likewise, you can also drizzle your glasses with chocolate syrup before pouring the hot chocolate into the glass for extra pizzazz and flavor. 0 Response to "The Best Frozen Hot Chocolate"